JUL 23, 2010 – MURDER FOR TWO opens at the Adirondack Theatre Festival! The two-person killer musical is back, in its first full production, from July 22 – 28! 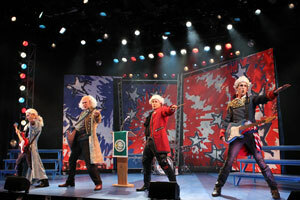 My song “The First Amendment” appears in the new musical WE THE PEOPLE: AMERICA ROCKS! 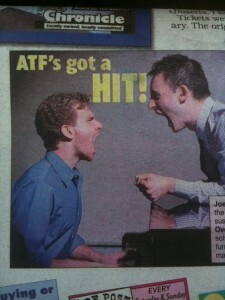 … and even gets a shout-out from Theatremania! Rock out with America’s original “boy band,” The Founding Fathers! Join Washington, Adams, Jefferson and Franklin as they trade in their powdered wigs for power chords to help an ambitious teen. On a quest to win her school election, Dawn cares more about padding her college applications than making her school a better place. With the help of these Fab Four, she discovers that “We the People” have the power to raise a patriotic ruckus and make a difference! Jon Stewart meets the Jonas Brothers in the world premiere of WE THE PEOPLE: AMERICA ROCKS!, a hip new musical for the whole family. Get your tix (FREE!) before it closes August 13!